Lakeside’s professional college counseling team combines dedication to Lakeside’s students with leadership in college counseling and college admissions. Ari Worthman has more than 15 years in the field of college counseling and college admissions. Worthman joined Lakeside in 2012, after serving as assistant director of admissions at Haverford College and associate director of college counseling at Pine Crest School in Fort Lauderdale, Florida. During his time in the field, Worthman has served in a variety of leadership positions, including on the Board of Directors of the Southern Association for College Admission Counseling, and as a trustee for the Association of College Counselors in Independent Schools (ACCIS), where he is immediate past chair of the board. Worthman regularly presents at national conferences on topics ranging from counseling and communicating with millennials; working with gay and lesbian students; forging relationships with colleges; the effectiveness of standardized test prep; and the myths and realities of highly selective admissions. A graduate of Haverford College, he holds a master’s from Florida Atlantic University. Tiffany Fujioka has extensive experience in college admissions and college counseling at the university and secondary level. As regional director of admissions for the University of Pennsylvania, she recruited students from across the country and was responsible for evaluating more than 1,400 annual applicants to all four of the university's undergraduate schools. She began her career at the University of Pennsylvania as associate director of the undergraduate division at the Wharton School, where she managed all marketing and recruitment, and served as an academic advisor and a member of the admissions committee. She has also served as a reader for Johns Hopkins University’s Office of Admissions. Fujioka served as associate director of college guidance at George School, a private Quaker boarding school, and worked as an independent college consultant with a company based in Cambridge, MA. An independent school graduate (she attended Iolani School in Hawaii), Fujioka has a bachelor’s in economics from the Wharton School of the University of Pennsylvania and a master’s in higher education management from the University of Pennsylvania Graduate School of Education. Sam Freccia offers the Lakeside community extensive knowledge of highly selective admissions processes. As assistant director of admissions at Colby College, Freccia served on the admissions committee, evaluated thousands of applications, interviewed hundreds of students, and traveled nationwide to talk to students about Colby and the admissions process. He also served on the selection committee for Colby's Presidential Scholar program, which admitted only the nation's top students. Freccia began his career in college admissions as an admissions fellow at his undergraduate alma mater, Colgate University. He attended Fairfield College Preparatory School in Connecticut. Mal Goss blends experience in college counseling with a comprehensive knowledge of Lakeside’s curriculum. 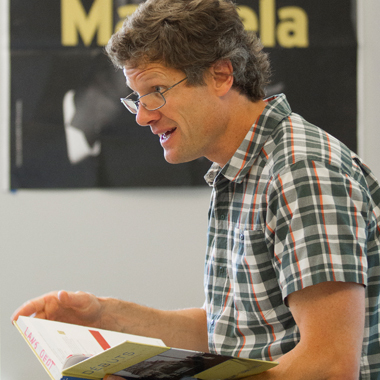 As a Lakeside English teacher, published writer, and former college essay tutor, Goss is skilled in working with students on personal essays and other writing. In addition to her work as a college counselor and in the classroom, Goss heads Lakeside’s curriculum grant program for faculty. Previous to joining Lakeside in 2014, she was a college counselor and English teacher at The Field School in Washington D.C., an independent school serving grades 6-12, and taught at Noble and Greenough School in Dedham, Mass., a day and boarding school for grades 7-12. She has a bachelor’s degree from The University of the Arts, a master’s degree in English literature and creative writing from Rutgers University, and a master’s in private school leadership from the Klingenstein Center at Teachers College, Columbia University. Mark Kranwinkle combines over 10 years of experience in college counseling with a deep knowledge of Lakeside as a teacher. As the parent of children who have recently gone through the college selection process, he is intimately familiar with the experience from a parent’s perspective. In addition to serving as a college counselor, Kranwinkle is a French teacher and the head of Lakeside’s language department. Previous to Lakeside, he was the upper school director at The Community School, an independent K-12 college preparatory school in Sun Valley, Idaho. Kranwinkle has a bachelor’s degree from Stanford University and a master’s degree from the University of Pennsylvania. 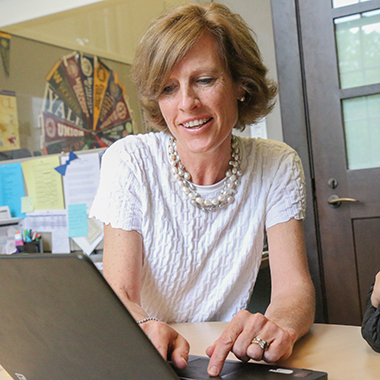 Catharine Jacobsen has more than 20 years of experience in Lakeside’s college counseling office, where she has also served as interim director of college counseling. She has visited over 100 college campuses in her time in the field, served on an accreditation team for the National Association of Independent Schools, and evaluated AP English Literature exams as a reader. Jacobsen previously taught English at Lakeside; Groton School in Massachusetts; Phillips Andover Academy in Massachusetts; and The Lawrenceville School in New Jersey. She has held several leadership positions in the Seattle community, including in the Seattle Children’s Hospital Guild Association, and as a trustee of the Seattle Shakespeare Company and Epiphany School. Jacobsen is a graduate of Dartmouth College and has a master’s in literature from the University of North Carolina at Chapel Hill. She is the parent of two Lakeside alumni. Marcia Chaddock has more than a decade of experience working with students, parents/guardians, and staff as a school counselor and teacher in independent high schools in Seattle and Honolulu. Most recently, Chaddock coordinated the admissions process as a program manager for the University of Washington Doctor of Physical Therapy program. A graduate of Tulane University, she holds two masters degrees in education from Seattle Pacific University, in school counseling and in teaching. An independent school graduate, she has a deep understanding and appreciation for the challenges students and families experience in a college-preparatory environment and enjoys supporting all students in their academic endeavors and personal and social growth.